Details make the difference and it could not be more clearly illustrated than viewing architectural elements on some of Warkworth’s finest buildings. There are 24 locations on the tour and whether historic or recent, it is the details that set these locations apart. The Village of Warkworth is part of a parcel of land originally purchased from the Mississauga First Nation in 1784 to provide land for United Empire Loyalist Settlers. Formerly known as Benfield, the name Warkworth was chosen in 1857 by a prominent early settle and militia leader, Major Henry Humphries, who had served in the Northumberland regiment in England. This self-guided tour has 18 locations and is a sampling of the various heritage styles found in the Village of Hastings. In 1810 William Hare, the first Crown land grant holder, sold 850 acres to Scots entpreneur James Crooks who named the site “Crooks Rapids”. In 1835, the government began planning the Trent canal system and by 1844 a dam and log slide were completed at this location. In 1851, Crooks sold his holdings to fellow Scot Henry Fowlds, an ambitious lumberman that renamed the village Hastings. 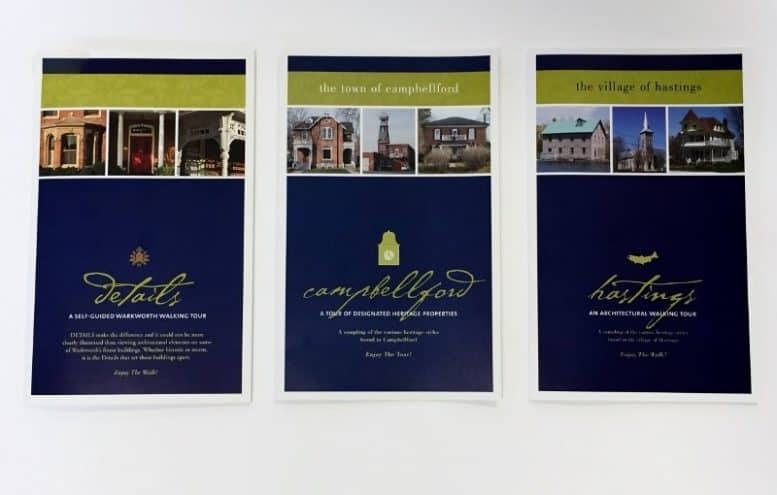 This tour includes 17 locations, a sampling of the various heritage styles found in Campbellford. Settlement in this area began in the Township of Seymour on the Trent River in the early 1830’s. At that time, Lieutenant Colonel Robert Campbell and his brother, Major David Campbell, received crown grants and purchased a total of 2800 acres of land. this became the nucleus of settlement on both side of the Trent River at a shallow area known as Campbell’s ford. By 1876 the settlement had grown so that the Village of Campbellford became a separate municipality, and in 1906 population increased to 2,251 – sufficient for Campbellford to be incorporated as a Town.